I have a couple of bold collar "statement pieces" made years ago from costume work, however they aren't as casual as I'd like them to be. I thought this was the perfect moment to show you a way of creating your very own collar treatment, and in leather form, because I love working with leather just as much as lace, but that's a whole other story! 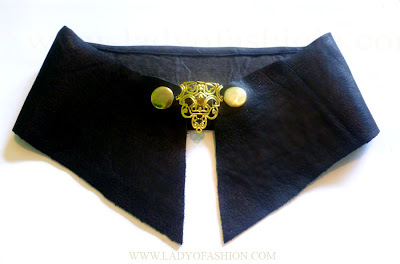 I designed several versions, and since there are many of you who have recently requested a few more simple sewing DIY's here's an easy version of my leather collar piece below. 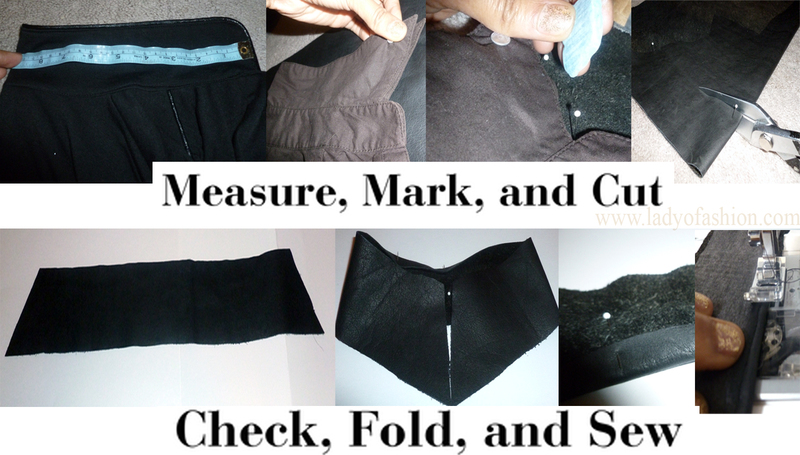 Measure collar from shirt or create a pattern. Either way is painless, however by saving time you can simply use a blouse or shirt as an outline. After deciding on the shape of your collar, mark and cut the leather. Make certain to follow the neck-curve, because your pattern will not be a straight line. You may create a piece with or without a collar stand. This version is done without a stand for my style versatility, and there’s hardly any sewing required. 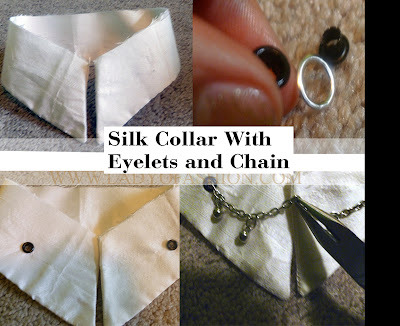 Of course, you may be prompted to use an ready-made collar with a stand from an old shirt as well! For stability cut interfusing, and adhere it to the collar piece by steam (ironing) or fabric bonding glue. Press flat. *This will be the same shape of your collar, yet slightly smaller than your collar piece from the top edge. Fold in the top edge of the collar and topstitch 1/8” (from right side toward wrong side), with the starting point approx. 5cm/2in.+/- away from the front end of the collar. With chalk or an awl mark placement for snaps, I opted to put them on the top part of my collar. Insert snap-tops: one on each side on the face side of the fabric. Put the collar on, measuring the distance between each snap and cut one strip of fabric/ neck strip (+ with interfusing) that covers this distance measurement + desired width. This measurement will depend on how you want your collar to look, i.e., having a more open or closed appeal, and/or how your snaps are initially placed. My neck strip is approx. 3”L X .625”W. 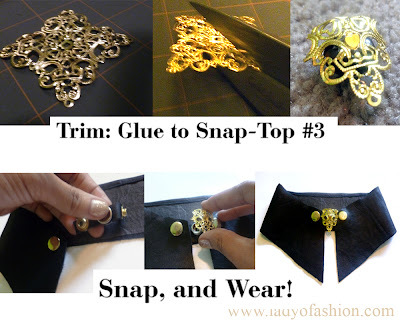 Add the snap-bottoms (snap #1 and #2) to each side of the neck strip, leaving space in the center for your trim. 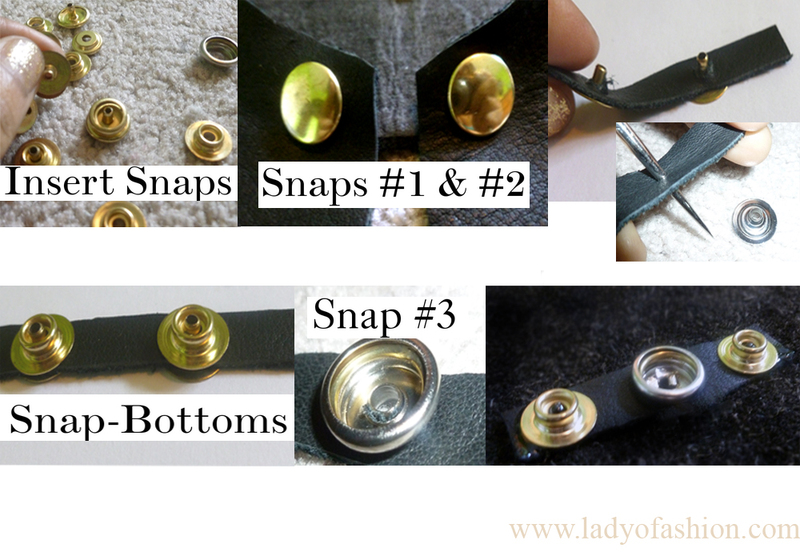 Add a new snap-bottom (snap #3) to the center of the neck strip. For my trim I cut and used a metal filigree design. Glue the snap-top (snap #3) to your trim. Let dry. With this snap technique I am able to change my collar by using other trims I've made ... if you want to use ribbon instead of snaps that's even easier! I also decided to make a second collar in a different style using shantung silk, old chain necklaces, and a button trim in black and white. Mission complete! Now you have a new leather collar statement piece! Stay tuned for more DIY's of all levels soon! Enjoy! These collars are awesome Madison!! Thanks so much Rocquelle! It was fun to create. This is sheer sheer genius, one of my fave craftista moment of yours of all time - purely because I am yet to make my own filled with studs and whatever else I have! Brilliant! Have a great week Madison! You really have embraced collars and made them fun statements! Great DIY! 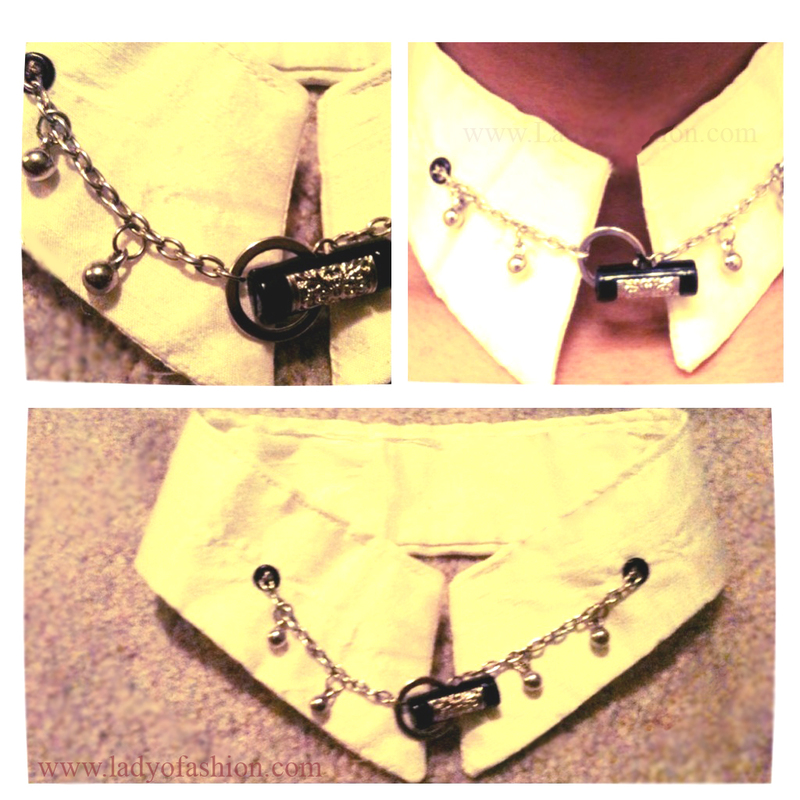 I love detachable collars, especially ones that have some kind of cute embellishment. ohhh these collars look awesome!! great DIY! You are definitely a leather and lace kind of girl. I love what you did with both collars, especially the black one. The gold detail in the center is killer. I've been wanting to do this for SO long! I wanted to stud a collar ;) These are super cute! Love these! I definitely need to get my hands on some leather and studs! This is an awesome DIY. I love the collar, and I've been seeing them everywhere but haven't tried it yet! Oh my gosh. So so cute! Love how it came out! You are so talented! I love the different feels of these collars and they look (kinda) easy! I should really try it out some time! OMG what a wonderful idea! You are a genius! Hope you are having a wonderful day! Style-Delights BlogPS. I invite you to enter an exciting INTERNATIONAL Giveaway! Thanks Alexis! They were definitely fun to make. Thanks Cheryl! hehe. Yes, I love leather and lace! Have a great week. Aww, Thank you Mary Jo! This version is quite easy! There are other complicated ones, but I'm certain you can do this one. Have a wonderful week! You genius!!! I love the idea!!! What a great idea to update some old looks! i love how it turned out! such a great idea! Oh my gosh you are so talented! I wish I could do this sort of thing. I love the first one. So amazing! Now that's what I call inspired: simple to make, fabulous to wear. i love your ideas for embellishing! there's so much you can do.. This is such an awesome tutorial. I wish I can pull off making my own detachable collars. I love this DIY- may have to try it for myself! Great DIY projects! Those are so incredibly chic! You are so creative and talented. Thanks for the inspiration! love the first one - it's so cool! This is such a great idea to be able to change the customisation using the press studs - I love it! Thanks for linking up. 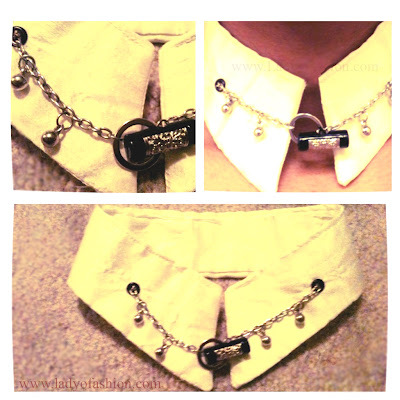 I LOVE these collars! I've gotta find these snaps! thanks for the DIY it is so great idea! I see you're also on DIYs , very interesting! I like the white one ! Thanks for sharing. I also posted a new DIY today too ! Come and have a look if you want !